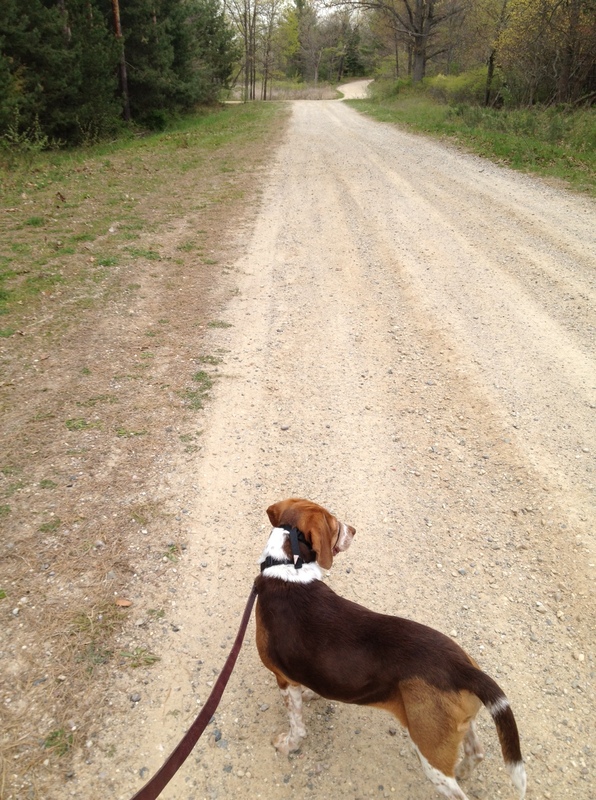 Hermes and I walking the trails at my cabin. Since getting my dog, (roughly a year ago,) I’ve spent a lot of time walking. I don’t have a fenced in yard, and he doesn’t like to chase balls, so for both of us, walking is the preferred method of exercise. I shoot for roughly an hour to an hour and a half a day. (Two to three 45 – 30 minute walks.) Over the last year we’ve walked in all kinds of weather: 100 degree plus summer days, blizzards, during tornado warnings, hailstorms, and through many a thunderstorm. The weather doesn’t really stop Hermes or I, though I confess to shortening the walks a bit this summer on those scorcher afternoons when I didn’t feel it was safe for either of us to be in the heat for too long. In the beginning I always had headphones on while walking. I love my npr podcasts: The Story, This American Life, Radio Lab, The Moth and more. Podcasts make me very happy. However, Hermes and I were going through the long process to teach him some leash manners, and eventually I realized that when I was listening to my podcasts, I wasn’t focusing on my dog. They were distracting and causing a bit of interference. I wasn’t quick to correct him and I wasn’t being consistent: basically I just wasn’t paying enough attention. I realized that I had to leave the earphones at home. And it made a difference. The training was better on my end, and in the last few months Hermes and I have come to what I will call an agreeable impasse. Oh, I still get frustrated when he occasionally pulls or stops dead in his tracks and he still gets frustrated when I won’t chase after rabbits with him, but we’ve found our own rhythm. According to my dog training books and the websites I read, Hermes still has terrible manners and that bothers me a little. However, I realized my “nose with paws” hound dog is never going to be an off leash dog, and it is just possible that we might never get past “good enough.” I am okay with that. Even though we have found a way of walking that works for us, I still haven’t added the headphones back in. I have discovered that I really like hearing what is going on around me – it feels safer when we walk through traffic, and there is no more fumbling to find the right pause button when someone stops me to say hello. More importantly, it gives me time to think. I try to change up our route regularly so we see different things (well, I see them, the pooch smells them,) but naturally I pass through the same areas regularly. I like looking at the houses, especially seeing people working on their homes and yards: those splashes of white that show that someone is priming their wood siding, the big dumpster in the front yard, a handyman sign stuck in the lawn. I love all the possibilities. I also enjoy looking at people’s gardens: from the homes with carefully manicured lawns and flowerbeds to the messy, fabulous urban gardens – complete with corn and chickens. Mostly though, when I walk, I think. I write blog posts in my head, (some of which actually get written, many of which don’t.) I ponder work problems, life issues, and all manner of big questions. Sometimes, I even come up with some answers. But then, eventually, usually as I am in the last part of the walk, all that goes away and I just walk, enjoying the silence in my head. I feel my muscles in my legs moving, the solid feeling of my feet hitting the ground, and notice my breath as it goes in and out of my lungs. I don’t want to say that it is zen, after all the slightest thing can disturb it – people walking by, my dog finding rabbit poo, a passing city bus – but I do feel very “in the moment.” It is my own form of meditation. Owning a dog has been both a joy and a royal pain in the keister, but as much as I dream of a fenced in yard and a full time dog walker, I have to say, these walks are some of the most peaceful parts of my day. This entry was posted in Friends and Family, Moments and tagged Hermes, Meditations, Outdoors, Reflections by GRLife. Bookmark the permalink.